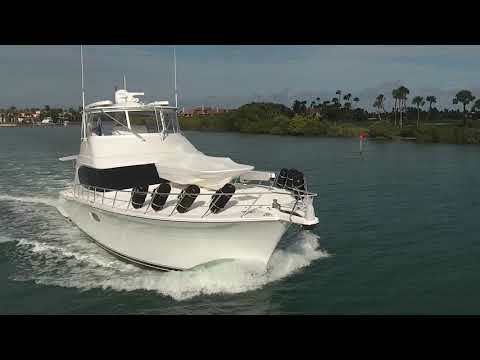 “Time Out” is a 2016 Hatteras GT 63 that is powered by MTU 12V-2000 Diesels @1900HP each with only 325 hours since new and a full 5 year warranty . Brand new Garmin Electronics package along with the new Quick anti-roll stabilizers just installed. This boat is like new with many custom features both inside and out. This boat is owned by a very knowledgeable owner and full time captain. Please see full listing for the complete details on this slightly used vessel. This Yacht is also kept on a lift and never fished. UHD Garmin 72 mile Radar 12KW WITH 4′ ARRAY. New 3 – sided Sea Acrylic enclosure. Built in Brownes third lung with 100′ hose. Twin Onan 21.5 KW Generators – 300 Hr. 24 – volt DC bilge and sump pumps. 15′ Commercial grade Boston Whaler with 85 HP Yamaha. Redesigned starboard salon cabinetry for a pop up 55″ LED TV. Brownies two person dive compressor with 100′ hose in stbd. wing. Nautical Structures 2200# Davit 126″-168″ Hydro rotation.